KindyROO UK Ltd. cares about your privacy. For this reason, we collect and use personal data only as it might be needed for us to deliver to you our world-class products, services, websites and Mobile Apps (collectively, “KindyROO services”). Under the Data Protection Act 1998, the EU General Data Protection Regulation (GDPR) approved by the EU Parliament on 14 April 2016 and related laws, we have a legal duty to protect the personal information we collect from you. If at any time you have questions about our practices or any of your rights described below, you may reach our Data Protection Officer (“DPO”) and our dedicated team that supports this office by contacting us at privacy@kindyroo.co.uk. This inbox is actively monitored and managed so that we can deliver an experience that you can confidently trust. 1.1 Information that is necessary for the use of KindyROO services. We ask for and collect the following personal information about you when you use KindyROO services. This information is necessary for the adequate performance of the contract between you and us and to allow us to comply with our legal obligations. Without it, we may not be able to provide you with all the requested services.  The email address allows the customer to enter the user portal and change his/her data as well as monitor his/her payments, class attendance and access additional services such as weekly handouts, neurological information etc.  The email address allows customers to be informed about upcoming early enrolment and discounting opportunities and anything they may need as information about the KindyROO Learning Process as well as informing them about upcoming events and seminars we organise.  Address: for postal correspondence including posting a certificate of completed class level.  Telephone: to inform the customer when there is unplanned change or cancellation of class times or days, any urgent messages related to the KindyROO learning process; to inform them about new term registration and respectively for them to know on time if there are any promotions they can benefit from.  Where did you hear about KindyROO? – this information is needed to measure the effectiveness of our communication and to enable us improve our services.  Child’s name: to be able to assign the child to age specific class, especially if the parent enrols more than one child. Address the child by name in class, helps them recognise their names from a young age.  Child’s gender: to plan the learning process and define the colour of the branded materials (including Welcome kits), that are different for boys and girls.  Child’s birth date: to enable customer to choose the appropriate KindyROO class. Since classes are formed by age principle without inputting date of birth of the child, the customer cannot choose appropriate class or any class for that matter. You may choose to provide us with additional personal information in order to obtain a better user experience when using KindyROO services. This additional information will be processed based on your consent.  Other Information. You may otherwise choose to provide us information when you fill in a form, conduct a search, update or add information to your KindyROO parent portal, respond to surveys, participate in promotions, or use other features of the KindyROO services.  Payment Information. To use certain features of KindyROO services (such as booking or purchasing), we may require you to provide certain financial information (like your bank account or credit card information) in order to facilitate the processing of payments (via external Payments provider). 2. Information We Automatically Collect from Your Use of KindyROO services and Payment Services. When you use KindyROO services and the Payment Services, we automatically collect information, including personal information, about the services you use and how you use them. This information is necessary for the adequate performance of the contract between you and us, to enable us to comply with legal obligations and given our legitimate interest in being able to provide and improve the functionalities of the KindyROO Services and Payment Services.  Usage Information. We collect information about your interactions with the KindyROO Services such as the pages or content you view.  Log Data. We automatically collect log data and device information when you access and use KindyROO Services. That information includes, among other things: details about how you’ve used KindyROO Services, IP address, access dates and times, unique identifiers, crash data, cookie data, and the pages you’ve viewed or engaged with before or after using KindyROO Services.  Payment Transaction Information. KindyROO Services collects information related to your payment transactions through KindyROO Services, including the payment instrument used, date and time, payment amount, payment instrument expiration date and billing postcode, PayPal email address, IBAN information, your address and other related transaction details. This information is necessary for the adequate performance of the contract between you and KindyROO to allow the provision of the Payment Services. KindyROO UK Ltd. may collect information, including personal information, which others provide about you when they use the KindyROO Services and the Payment Services, or obtain information from other sources and combine that with information we collect through the KindyROO Services and the Payment Services. We do not control, supervise or respond for how the third parties providing your information process your personal data, and any information request regarding the disclosure of your personal information to us should be directed to such third parties.  Third Party Services. If you link, connect, or login to our Mobile Apps with a third party service (e.g. Google or Facebook), the third party service may send us information such as your registration and profile information from that service. This information varies and is controlled by that service or as authorised by you via your privacy settings at that service.  Other Sources. To the extent permitted by applicable law, we may receive additional information about you, such as demographic data or fraud detection information, from third party service providers and/or partners, and combine it with information we have about you. • Understand and analyse how you use KindyROO Services and what products and services are most relevant to you. Often, much of the data collected is aggregated or statistical data about how individuals use KindyROO Services, and is not linked to any personal data, but to the extent it is itself personal data, or is linked or linkable to personal data, we treat it accordingly. KindyROO organisations that will deliver the services to you: KindyROO UK Ltd., its franchisor and its franchisee for the chosen by you centre have access to the provided personal data. An example: When customer registers in KindyROO Switzerland website and chooses KindyROO Zurich centre, his/her data is visible to: KindyROO UK Ltd, BrightSparks Learning GmbH, Alte Landstrasse 75, 8803 Ruschlikon, HR-Nummer: CH-020.4.062.314-8, UID CHE-332.435.875 (the franchisee for that centre) and to TKG Pty Australia (master franchisor and owner of KindyROO trade mark and brand). Data access is also available to the company that supports KindyROO’s technology. If you would like to request that your personal information is removed from our database, please contact us at privacy@kindyroo.co.uk. To easily access, view, update or delete your personal data (where available), or to update your subscription preferences, please log onto y our portal and change the data you want to be changed. If you are unable for any reason to access your portal, you may also contact us by one of the methods described in the “Contact Us” section below and if you request us to do so, we will remove your personal data from our servers maximum within 30 (thirty) days. We follow generally accepted standards to store and protect the personal data we collect, both during transmission and once received and stored, including utilisation of encryption where appropriate. We retain personal data only for as long as necessary to provide the services you have requested and thereafter for a variety of legitimate legal or business purposes. If you have any questions about the security or retention of your personal data, you can contact us at privacy@kindyroo.co.uk. VI. Transfer in the Event of Sale or Change in Control. We may transfer information, including your personal information, in connection with a merger, sale, reorganization, acquisition or other change of ownership or control by or of KindyROO UK Ltd. or any affiliated company (in each case, whether in whole or in part). When one of these events occurs, we will use reasonable efforts to notify users before their information becomes subject to different privacy and security policies and practices. Welcome to our website and our programme. Kindyroo UK Ltd owns and manages the website. BrightSparks Learning GmbH owns and manages the centres in Zurich and Horgen. In Switzerland KindyROO operates via Kindyroo UK and its franchisees and complies with the law in Switzerland and UK. The term “Kindyroo ” or “us” or “we” refers to the owner of the website whose registered office is Booth Street Chambers, 32 Booth Street, Ashton-Under-Lyne, Lancashire, OL6 7LQ, UK ; c ompany registration number : 9225168 (Registered in England & Wales) and to BrightSparks Learning GmbH, Alte Landstrasse 75, 8803 Rüschlikon, HR-Nummer: CH-020.4.062.314-8, UID CHE-332.435.875, who owns and manages Zurich and Horgen centres. The term “you” refers to the user or viewer of our website and registered parent on our website. When you register on our site you receive the opportunity to enrol for a trial lesson, enrol for term (or remainder of a term) and re-enrol for consecutive terms. When you attend Kindyroo classes with your registered child/children you bare full responsibility for the child’s/children’s safety at all times. 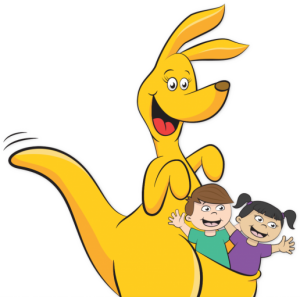 You agree that your child’s/children’s wellbeing and safety when attending a Kindyroo class in a Kindyroo centre is fully your responsibility and you do attend at your own consent. Unauthorised use of this website may give to a claim for damages and/or be a criminal offence. From time to time this website may also include links to other websites. These links are provided for your convenience to provide further information. They do not signify that we endorse the website. We have no responsibility for the content of the linked website. You may not create a link to this website from another website or document without Kindyroo UK Ltd prior written consent.